We live in an age of information. 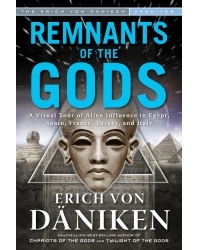 But there are things in our prehistory “about which we do not have the faintest idea,” writes best-selling author Erich von Däniken in his gripping new book, Remnants of the Gods. Stone structures erected by master builders, mysterious underground complexes, geometrically aligned stone circles, the breathtaking pyramids of Egypt—who built them? And, perhaps more importantly, where did these builders obtain such incredible knowledge? Erich von Däniken shows in detail how whole countries were surveyed thousands of years ago. Hundreds of Stone Age holy places are located at equal distances from one another, forming giant squares and triangles. How was all of this possible? Classic archaeology provides no answers to these questions. Worse still, it doesn’t even appear to be interested. Are we all threatening to become “camp followers of disinterest,” as Erich asks? Featuring more than 160 color photos and illustrations, Erich reveals the secrets of “impossible buildings” in Europe and the Mediterranean region, describes “crazy facts,” and relentlessly exposes false doctrines. Remnants of the Gods will make even strident skeptics reconsider what they think they know of the past. Erich von Däniken is arguably the most widely read and most-copied nonfiction author in the world. He published his first (and bestknown) book, Chariots of the Gods, in 1968. The worldwide best-seller and was followed by 32 more books, including the recent best-sellers Twilight of the Gods, History Is Wrong, Evidence of the Gods, and Odyssey of the Gods (all published by New Page Books). His works have been translated into 28 languages and have sold more than 63 million copies. Several have also been made into films. Von Däniken’s ideas have been the inspiration for a wide range of TV series, including the History Channel’s hit Ancient Aliens. He lives in Switzerland but is an ever-present figure on the international lecture circuit. © 2018 Red Wheel/Weiser, Inc. All rights reserved.